Can we get a geology professor over here? An odd photo of an "interesting rock formation" is going viral on Twitter. The formation? 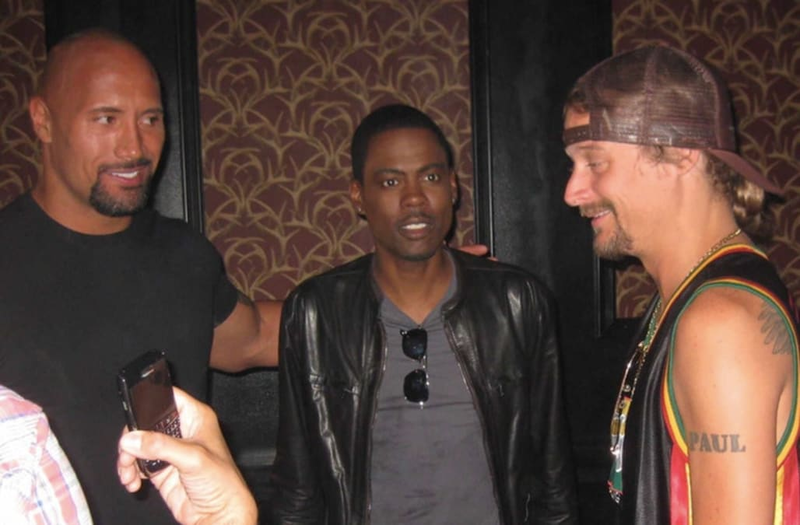 Dwayne "The Rock" Johnson, Chris Rock, and Kid Rock. It's exactly as weird as it sounds, and we have a lot of questions. Let's go left to right. The Rock's expression is almost unrecognizable, with shifty eyes and a half-smile, as if he's not sure what events could have possibly led him to this situation. He has his arm around Chris Rock, who looks like a shellshocked witness to an real-time murder. Meanwhile, Kid Rock has managed to fall into deep slumber despite his upright stature and a blinding camera flash. The undated photo was likely taken awhile ago, since The Rock has sported a more clean-shaven look in recent months. Check out that Blackberry. We're guessing 2007, maybe 2008. Hopefully in the assumed decade since he was captured in this shot, Chris Rock has recovered from whatever horrific scene unfolded in front of him on that fateful day.